The more money you save, the more you earn! It starts with wanting to save and then choosing the right banking options. 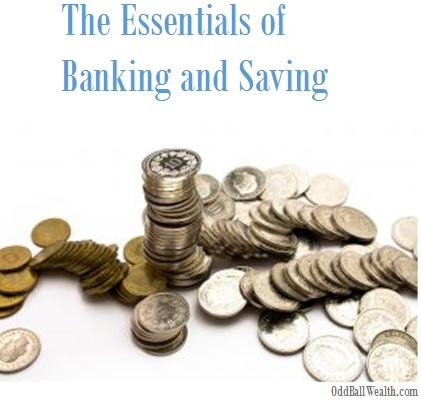 We talk about banking and saving principles and expand upon your financial knowledge. Putting your money in a bank account is one of the safest places to store your cash. This is because bank accounts are federally insured by the government, currently up to $250,000. By having money in a bank account, you’re taking on minimum risk and you pay for that low risk with low-interest rates or a low-yield return on your money. You could earn higher returns on your money by having it in other investments, such as mutual funds or index funds, but you would essentially be taking on greater risk. For related information, you can read the article 8 Reasons Why Index Funds Rock! Banks will normally charge you a fee if you don’t maintain a minimum balance. To avoid fees, check to see what fees a bank may charge before opening an account and compare fees to other banks. If your bank requires a minimum balance, monitor your account regularly and be sure your balance stays above the minimum requirements. Inflation in currently low, but the interest you earn in a bank account is probably lower. Inflation lowers the value of a dollar and raises the price of goods and services. Generally, the interest you earn in a bank account will not keep up with inflation. Banks offer an account called Certificates of Deposit or CDs, which generally pay higher interest rates than basic savings accounts and are also federally insured up to $250,000. When you open a CD account, you’re agreeing not to withdraw those funds for a certain period of time. The period of time ranges from months to years. You do take on a bit of risk with CDs because if interest rates rise during the time your money is in a CD, you’ll stuck with a lower rate and won’t be able to take your money out without paying a penalty fee. If the opposite happens and rates fall, you benefit because your rate is locked in. Read the article Money Market vs. Certificate of Deposit (CDs) to learn more. Consider opening an account with an online bank. By banking online, you can receive much higher interest rates than what most brick-and-mortar banks offer. Read Higher Interest Rates Make Banking Online Attractive to learn more. Many financial institutions offer similar services as banks. One that is becoming very popular is credit unions. The services a credit union offers are nearly identical to a bank, the difference is credit unions are owned by their members (the customers). Many times, because they’re member-owned offer better interest rates than brick-and-mortar banks and have few if not any fees.